Yesterday I woke up to a gray sky, a dusting of snow, and howling wind. I am not a cold weather person, and immediately thought it would take another force of nature to even get me outside. It turns out that all I really needed was to peek in my bare fridge to get motivated and brave the cold to head to the store. Today was a perfect day for comfort food. 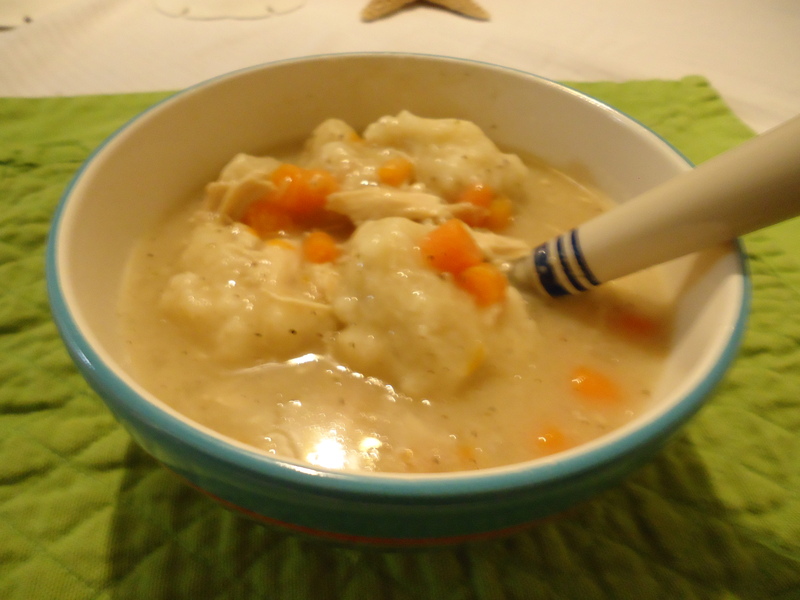 Enter easy chicken and dumplings! 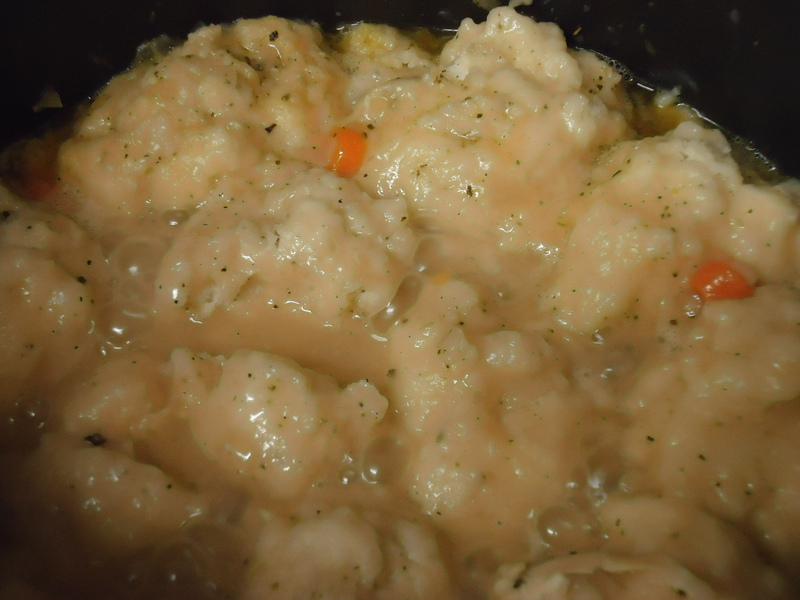 This recipe is easy and can be personalized to include all of things you like in a chicken soup/stew. It’s also perfect for a lazy day because it doesn’t require a lot of babysitting the pot, and because I used a few shortcuts in the kitchen (rotisserie chicken, store-bought stock, Bisquick mix). In a large pot, melt the tbs of olive oil and 2 tbs of butter over medium high heat. 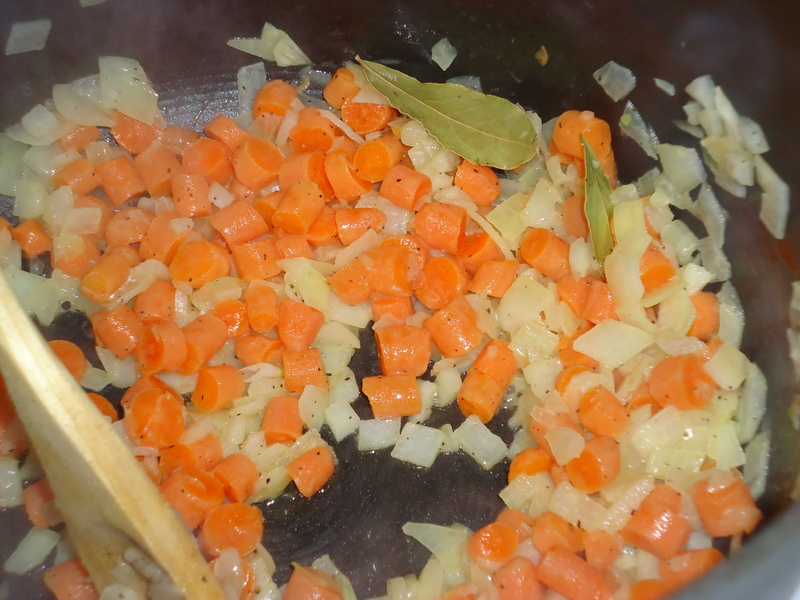 Add chopped carrots, onions, and 2 bay leaves to the pot. Cook veggies and bay leaves for approx. 5 minutes or until they become tender. Then add 6 cups of chicken stock and tbs of dried sage. Now it’s time to start checking the taste of your broth. Feel free to adjust the seasoning with a little pinch (or several pinches) of salt and pepper to your taste. 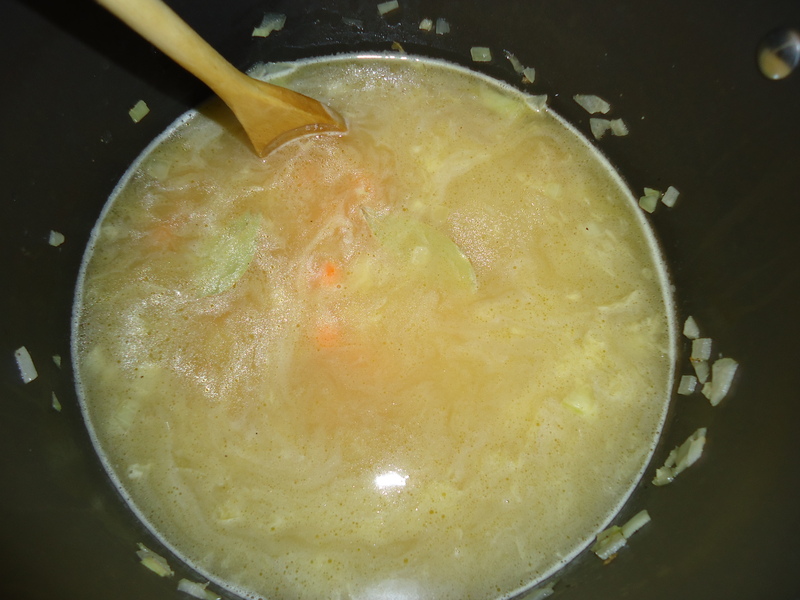 Increase the heat to high to bring the soup to a boil. 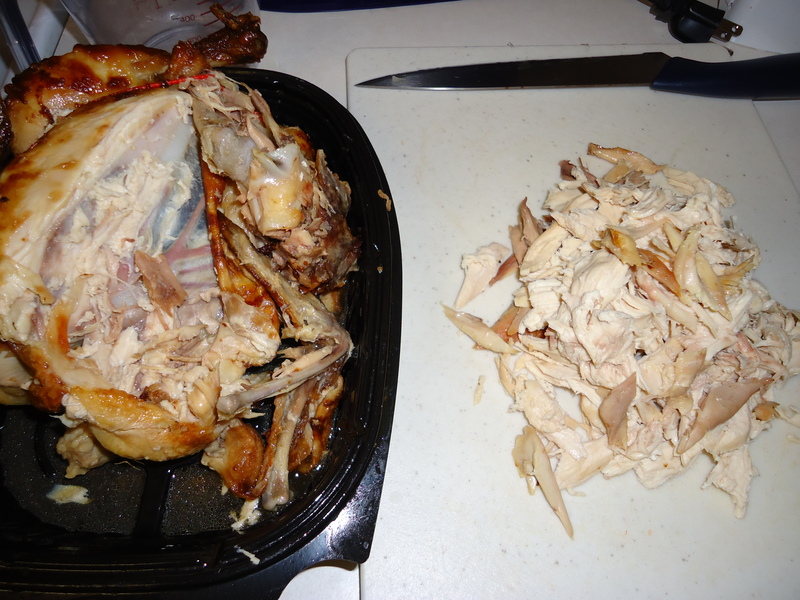 While you wait, shred half a rotisserie chicken into bite-sized pieces and add to pot. Remember, your chicken is already cooked, so you don’t want to overdo it! Boil for 2 minutes while you make the dumplings. In a medium mixing bowl add 2 cups of Bisquick mix with 2/3 cup skim milk. 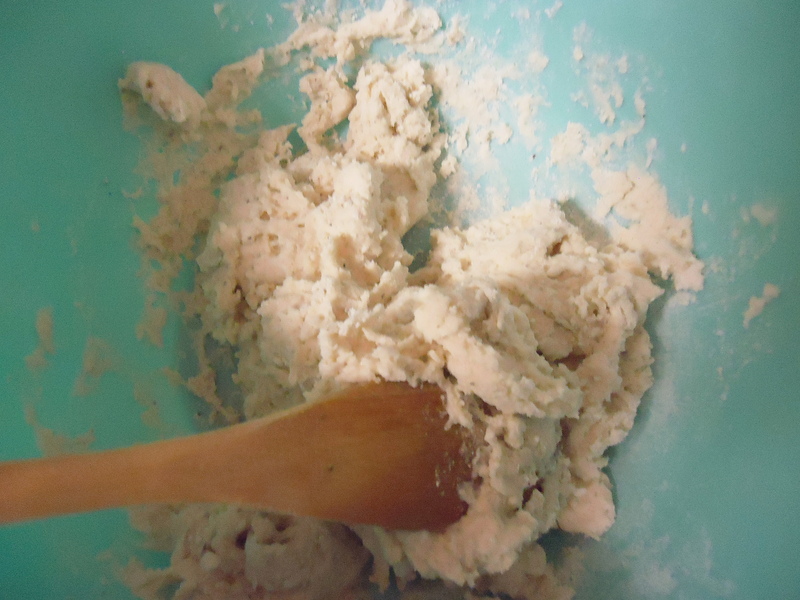 Add tsp of salt, tsp of pepper, and tsp of dried sage and mix with a wooden spoon until it forms a sticky dough. This should only take a minute. 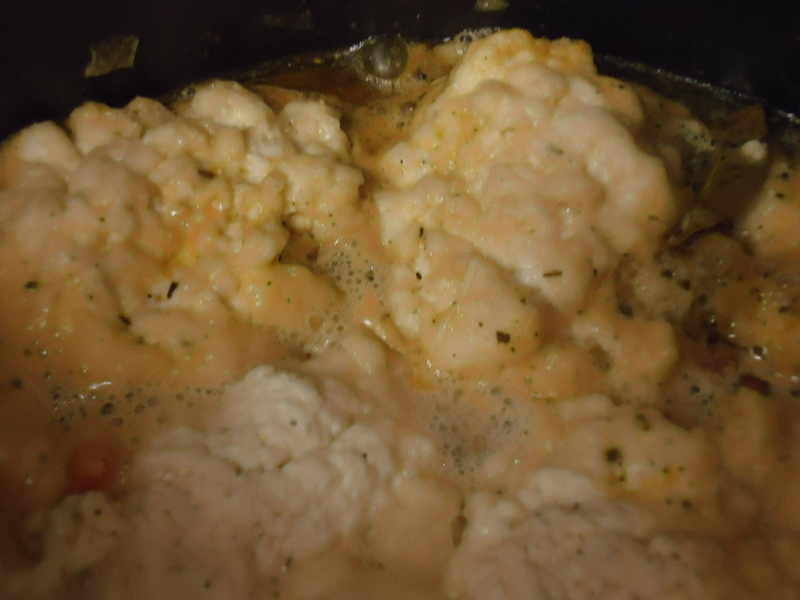 Reduce heat to medium low and drop spoonfuls of dumpling dough into the pot. Cook uncovered for 10 minutes. 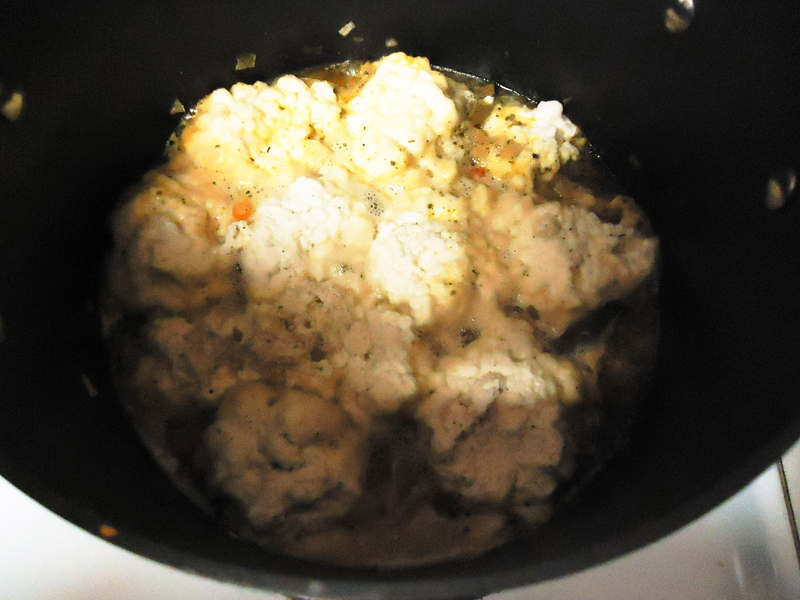 After 10 minutes, break up the dumplings in the pot and flip them over. Don’t worry if they fall apart, that just means you’ll have mini dumplings and some in every bite. 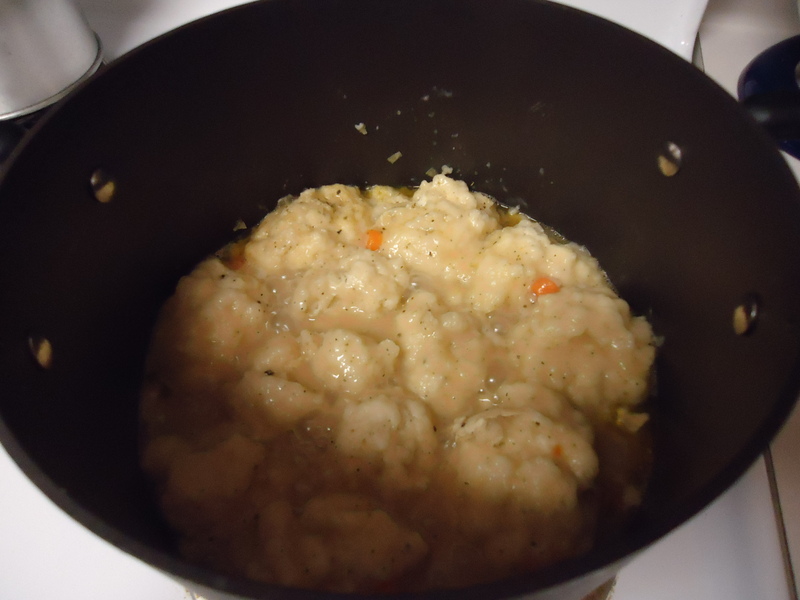 Once you’ve flipped the dumplings, cover the pot and cook for 10 more minutes. As soon as you hear the timer, get yourself a ladle and a glass of milk to drink. YUM! This soup is cozy and a welcome accompaniment to any movie or tv marathon. It looks just perfect and it is, well…except for the part about adding the peas! I completely forgot about them. 😉 If you want to add them to your soup, put them in the pot at the same time as the shredded chicken and sage. I think they add a little bit of sweetness and some more color. If not, I promise this soup can stand on its own without them! My stomach is already growling in anticipation of the leftovers. Great post! These dumplings look super yummy! Made it last night!! Nommy nom nom, thanks Meg! Now that I have a completely remodeled kitchen I will be motivated to try this one and any others you share – especially the desserts you are so famous for! Megan – This was SUPER-YUMMY! We made it last night for dinner as the snow was starting to fall and the wind was howling. It was a total hit for all (including Addison, who is picky about EVERYTHING!) We can’t wait for the next post!! !